They say waste not, want not, and there's no better example of that than a WVO or bio-diesel-powered car. Today's Nice Price or Crack Pipe Mercedes can go vegan, but does its price make you say, what a waste? It turns out Ned Flanders isn't the role model he was cracked up to be, as yesterday his choice of wheels - represented by a PCH Geo Metro - racked up an okalie-dokalie 60% Crack Pipe loss. Safety and durability issues, plus the crushing loss of personal dignity when driving a Metro, were the primary reasons behind the vote. But are those all inescapable foibles of lowering your fuel consumption and sticking it to the oil companies? Today's 1981 Mercedes Benz 300SD is evidence otherwise, despite its smelling of french fries and sounding like it has a rock tumbler under hood. As was pointed out by Monday's diesel VW, one way to lower your fuel bill is by going high-mileage, although that truck's price proved too high to make it a viable cost-saver. This W126 Benz is not only a diesel, but it has been converted to run on the dregs of your local Fat Burger fryer or Stridex pad pressings. And not only will it burn nearly anything vegisaurus-related but producing fuel for it also will mean artery-clogging fried fare for you, which as we all know is damn tasty. The S-Class has represented the top of the Benz food chain for decades, and this decades-old 300 remains as close to driving a bank vault as you are going to come without the threat of asphyxiation and those meddling kids. Appropriately beige and with enough plastic cladding to make contemporary Pontiacs green with envy, the body looks solid and lacking in major issues. The front bumper - as is the case with many ‘80s cars saddled with the 5-mph rams - seems to jut out excessively, and that combined with its discoloring, gives the car the awkward appearance of Popeye the Sailor having just polished off some creamed spinach. Popeye's girlfriend was the pipe cleaner-like Olive Oyl, and not only is the turbo 5-pot in this Benz able to run on her namesake, but it likely will do so for decades to come. The OM617 turbo diesel weighs in at 2,998-ccs and 125-bhp. That may not seem like enough to get the 3,680-lb car rolling, but its 180 lb-ft of torque assures that it will. And, not only that but it may just be the most durable automotive engine. . . in the woooorld. The engine will still run on diesel, but it has what is claimed to be an Elsbett Vegetable Oil System allowing it to also run on that goopy stuff from KFC - and I don't mean their gravy. They say variety is the spice of life, and if so, this multi-oil burning Benz is habanero considering all you could stick down its fuel pipe. You might not feel that way while sitting in its somewhat austere interior, but even 30-years down the road it still exudes class. There are some cracks in the dash, and the passenger's seat is sort of a different shade of beige, giving the interior a kind of trucker's tan appearance. Other than that, it's roomy and should ride with the authority and dignity of an Aryan aristocrat what with its new tie rods and alignment. With only 174,000 on the clock, it's surprising those needed replacing. What's the downside to this amazing, frugal and potentially OPEC-free luxury sedan? Well, the seller says that the odometer doesn't always work, and that one of the back windows is stuck in place- but at least it's stuck up. There's mention of some ominous CarFax information regarding rebuilds although it doesn't appear to have a salvage title. Finally, there's the fact that you're unlikely to get the same BTU content in bio-diesel or EVOO (damn you, Rachael Ray!) than in the real thing, so YMMV. But if you're filling the tank by milking teenagers' foreheads rather than getting SUNOCO'd up the keister, that's less important- eat all you want, we'll make more. That makes this a substantially different paradigm than Monday's Vee-Dub, and, unlike yesterday's paper mache Metro, this 300 will share the cockroaches post-apocalyptic survival. Amortize its $3,950 price over that upcoming bug-infested millennium and it works out to just pennies a month. Sadly, few of you will be joining me in living forever, so you'll probably need to plug a shorter term into your actuarial tables. 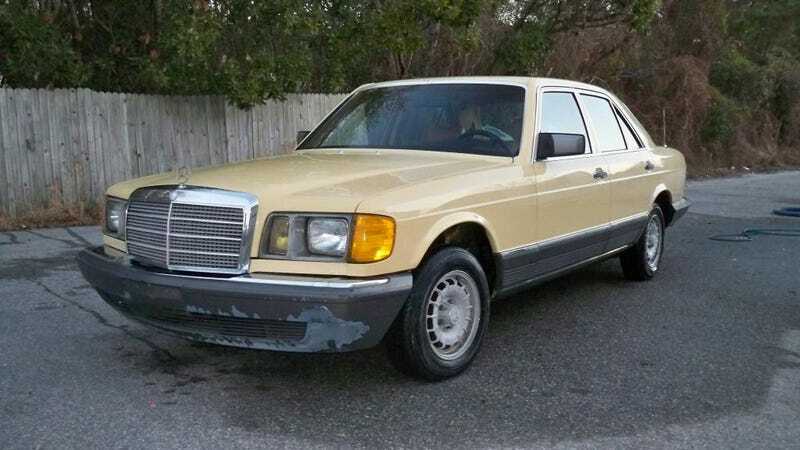 In that case, what do you think about $3,950 for this Mercedes Veg? Is that a good price for so much choice in fuels? Or, does that make it a bio-hazard?